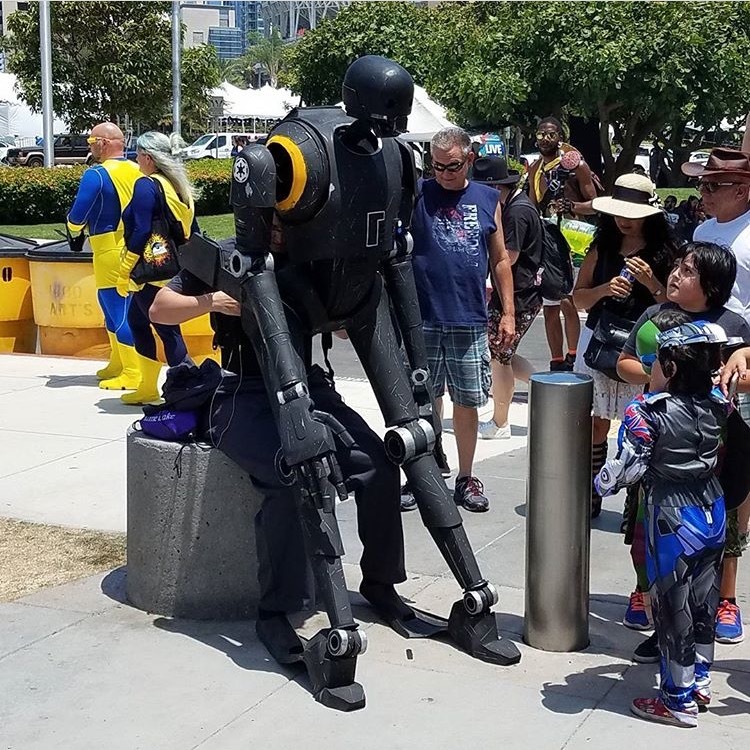 In a whirlwind of last minute plans I headed down with a fellow droid builder to San Diego Comic-Con's intense Saturday crowd! 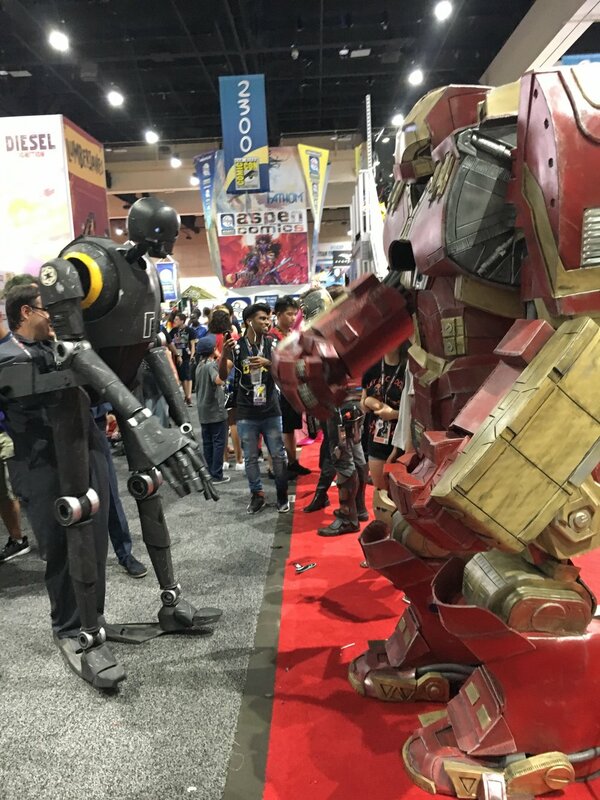 I had heard of SDCC as a nerd mecca. 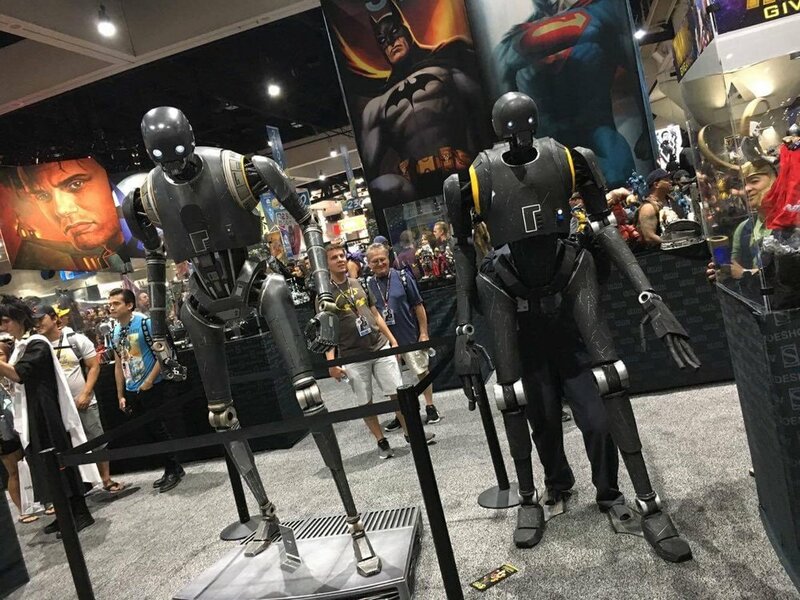 I had to walk a partially disassembled K-2SO a half mile from our parking garage to the east lawn of the San Diego convention center. Here I completed final assembly and headed towards the front doors. Major malfunction! After about 20 feet I felt a pop and the top connection bolt that held K2 to my chest harness broke. He started to pitch forward and I sat myself down on a short barricade pillar to conduct some emergency repairs. I couldn't remove K2 on my own so I shimmied out of the top of my gray coveralls and lengthened the straps of my harness to make a cross connection over the connection pipe, strapping it together for the time being. K2 made it inside but the modifications were extremely tight on my chest and I was sweating buckets from the humidity and exertion. 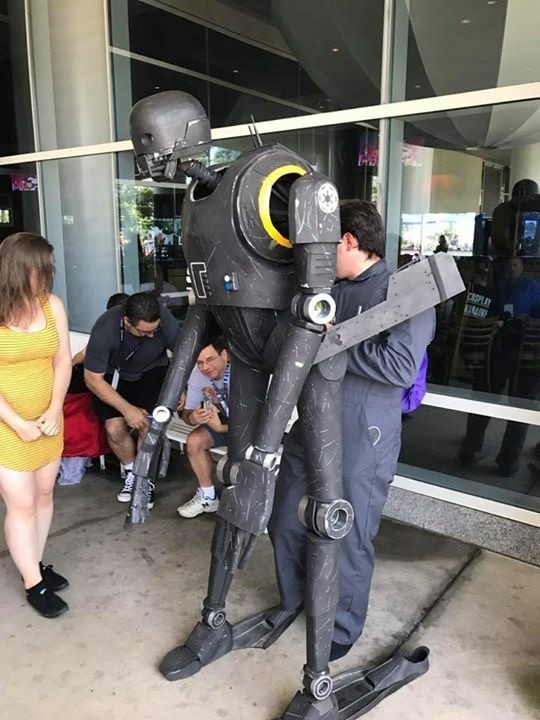 I found a 501st Legion friend who helped me secure a chair to sit in for a moments rest and procured a handful of zip-ties from a nearby booth for more permanent repairs. With the harness fixed I met up with some family friends who were cosplaying as Rey, Jyn and Episode 8 Luke Skywalker. 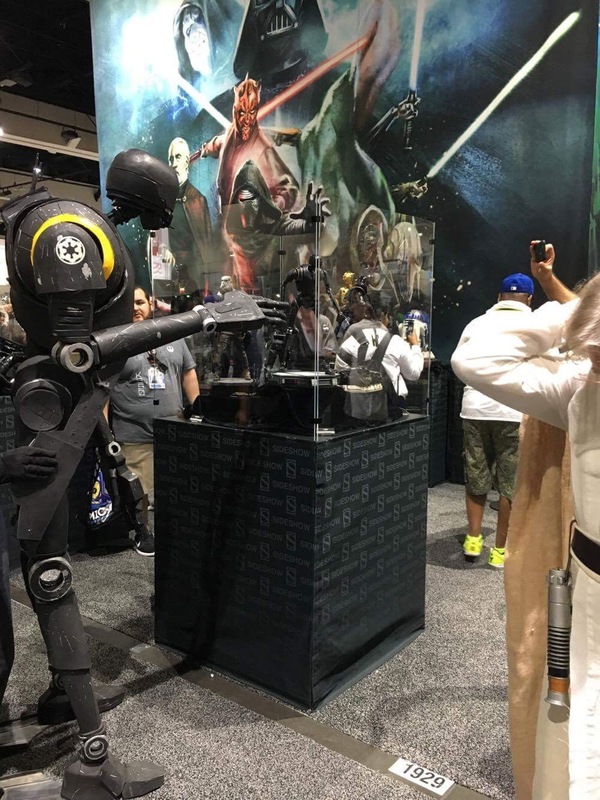 We made our way to my first stop, the Sideshow Collections booth. 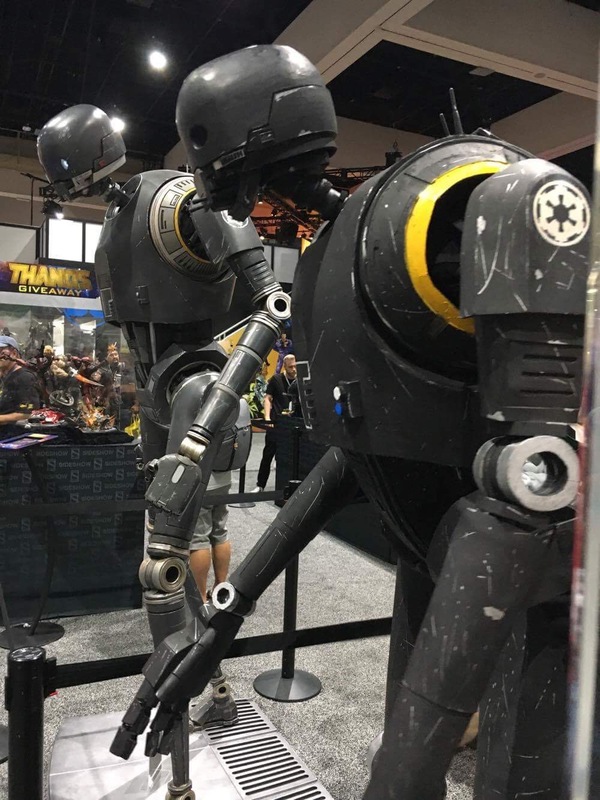 I had only 2 things on my list for the day and seeing the 1:1 scale K-2SO model was one of them. 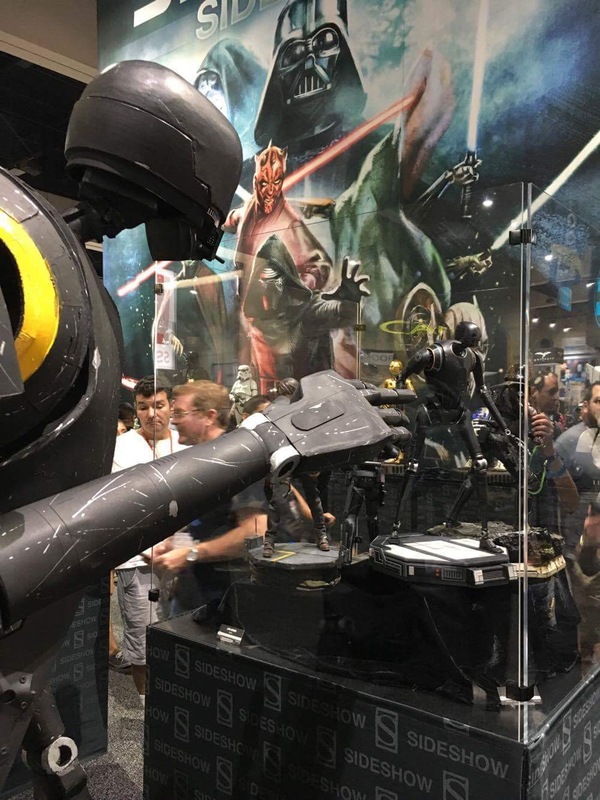 A man with a video camera seemed to be interviewing in front of the statue and was very surprised to see ANOTHER K-2SO standing behind him. I got some great shots with the model and pictures with some of the Sideshow booth staff. Our second stop was the Lucasfilm Star Wars booth where we posed for our picture in front of their awesome Rebel HQ display. This area also had a nice spot on thick carpet with some AC flow where we set up camp for half an hour for pictures. Many people took shots with us and enjoyed all of our costumes. 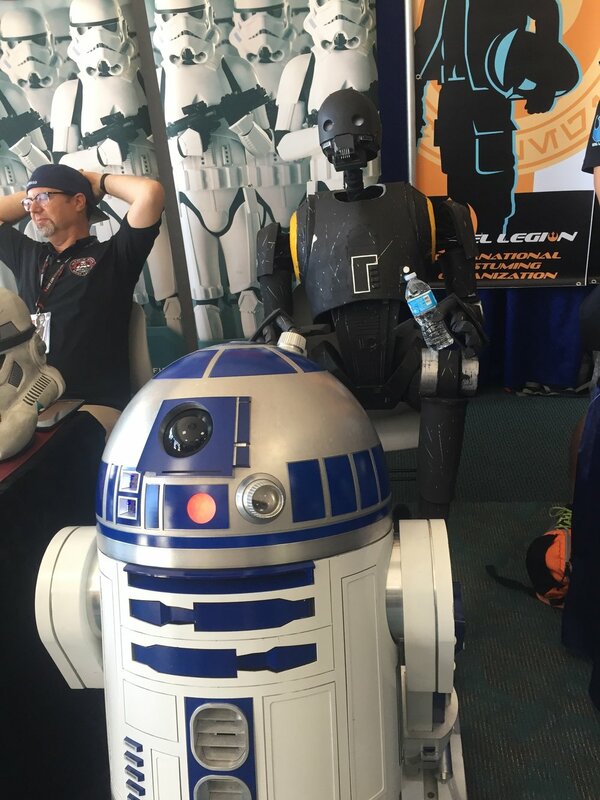 I took a break from wearing K2, at the Rebel Legion and 501st Legion booths on the second level and had some con lunch before heading back out onto the main floor for more pictures. 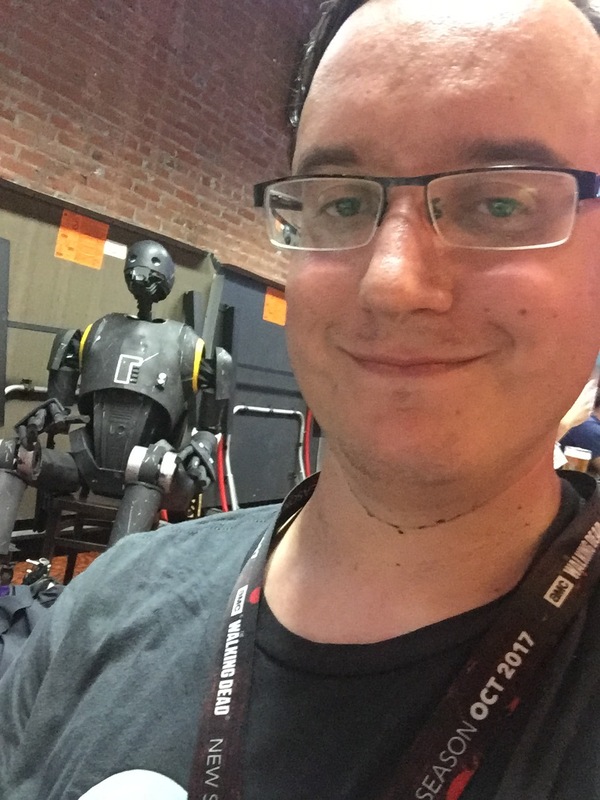 I received many positive comments on K2 and the puppeteering behind him. Everyone seemed to get a kick out of the camera/monitor setup I had to see in front of me. 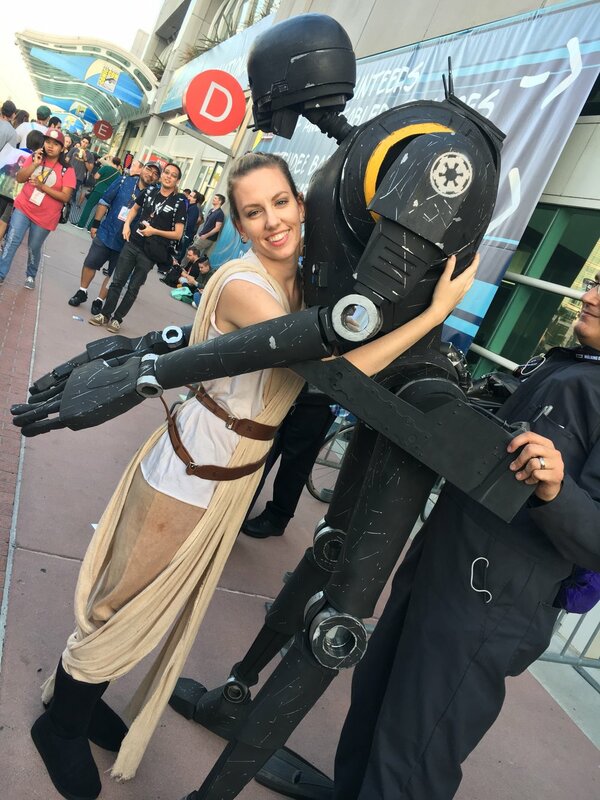 I even had someone who worked on Rogue One tell me she loved the puppet and was going to share my picture with one of the editors. 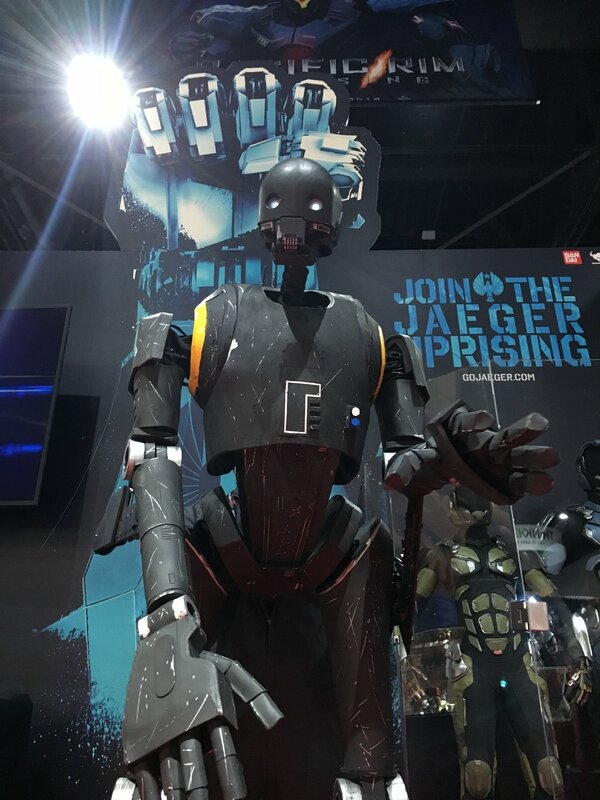 K-2SO is a great character and everyone loved seeing him walking around the booth alleys. Though i'll need to put some shop time in fixing his harness system he performed very well under intense con conditions. Though it was quite a workout wearing him for almost 8 hours. 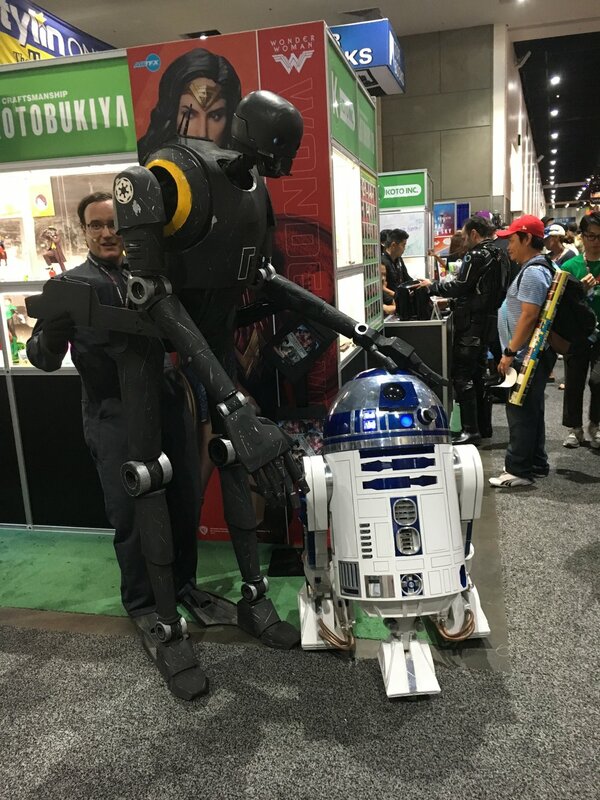 I can't wait to complete his neck servo and hand upgrades for future events and conventions. Thank you San Diego, we had a blast!